Horses are among the most complex creatures in the animal kingdom: so much can go wrong so quickly. And when it does, these delicate, injury prone beasts need swift treatment. Otherwise, a simple eating disorder might rapidly lead to death and a minor hoof injury to permanent lameness. To make things even more difficult, equine veterinary care is costly and insurance prohibitively expensive. That’s why any horse owner, as well as equine veterinarians and students of veterinary medicine, must have this ultimate resource on hand. 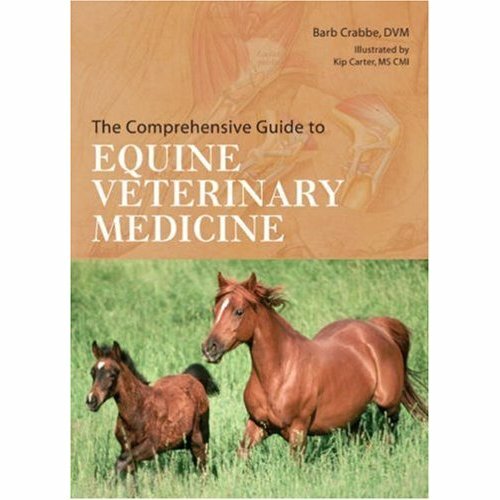 The Comprehensive Guide to Equine Veterinary Medicine is a thorough, carefully designed medical reference featuring four-color anatomical drawings by the most acclaimed veterinary illustrator Kip Carter. It covers all areas of equine health, including diagnosis and treatment, and delves into basic equine behavior and safety, preventive health care, and first aid. Twelve in-depth chapters outline the individual body systems, anatomy and physiology, and abnormalities. A Health Care section includes alternative therapies such as acupuncture and homeopathy, along with options for rehabilitation and physical therapy. Critical information appears in tables, charts, side bars, and bulleted lists for quick access. In addition, there’s an informative history of veterinary procedures, followed by three valuable appendices with terminology, common medications, and advice for the first-time horse owner. A selection of the Equestrian Book Club.